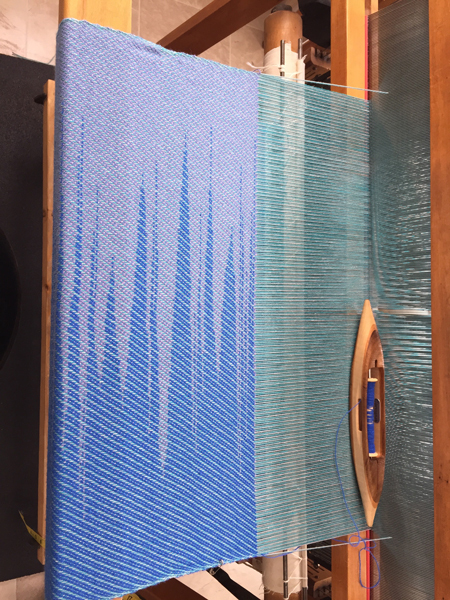 Although I have woven a grand total of 4 tapestries, completing half of them, I faithfully read Sarah Swett’s blog. She fills it with her photos, drawings, paintings, and stories, as well as her beautiful tapestries. Well over a year ago she posted a skirt she made using a combination of weaving and knitting. I LOVED it! I wanted to do it. But I was busy and the idea just sat at the back of my mind. That was the easiest part for me. After the weaving was done I dutifully followed Sarah’s directions for calculating the knitted sections. I started by knitting up a swatch. You know I hate to sample, but I had to get a gauge for the yarn and pattern I wanted to use. I chuckled when her directions said to knit a swatch, or knit five. Five samples! She must be joking! Well, I ended up knitting five swatches. None of the colors I had were really what I wanted. I went to Joann Fabrics and bought a yarn that I thought would be perfect, but the variegation didn’t work the way I wanted at all (center swatch). I then went to the lovely fancy yarn store and bought a skein of stunningly soft and beautiful expensive yarn. At least all the samples I had knit were the same weight yarn, and were all the same size, so I didn’t feel a need to knit one more with the new yarn. I just started knitting those panels. Then I cut my handwoven fabric into panels and started putting the skirt together as planned. But wait! What’s wrong? Hmmmmm… You know how your teachers always told you to read all the directions before you started the test? Well this was sort of like that. First I realized that I planned the weaving wrong, with my selvedges at the waist and hem of the skirt, not the sides of the panels as Sarah had. That’s okay, it’ll work out the same. Then I somehow couldn’t wrap my mind around how many knit panels I needed. 3 or 4? Why couldn’t my brain understand? 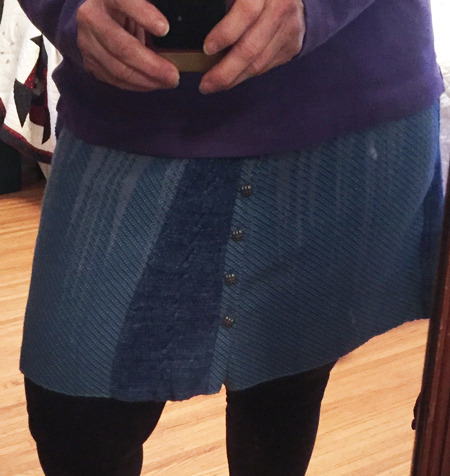 Then after I stitched the first 3 knit and woven panels together it was clear to me that the skirt wouldn’t fit, it would be too small for me despite my careful measurements. Luckily I enough extra fabric for one wider panel. Okay, take a breath and let’s proceed. I put everything together and tried the skirt on. Well poop! Despite my best efforts, there was puckering at every seam of knit and woven fabric. Fortunately I’d hand sewn it all, so it could be taken out without any damage to either side, just a lot of sighing. Then I laid it flat on a table and actually basted the pieces together. (Previously I’d sewn as I went, sitting on a chair, with fabric over my lap – not flat, not basted. Wrong, wrong, wrong.) I hand stitched it all together again. Now I was thinking about the button closures. My knit panels were made from a lusciously soft, single ply sock weight yarn. I didn’t think this was a good fit with buttonholes – the yarn would stretch out of shape too easily. Nor did I think it was good to hold the buttons. Similarly my woven fabric was too thin and soft. So I had to reconfigure the plan and make a narrow strip of doubled woven fabric for the buttonholes, double the fabric on the other side for the buttons. I made another trip to Joann’s for buttons, as nothing I had at home was right. Found some I really liked, so now I could make the buttonholes. Putting everything together, it was clear that the skirt was still not going to fit right. How could this be, after all I’d done?! Answer, unlike Sarah, my body has plenty of lumps. My belly is bigger than my waist, so a straight line from the waist down would be too small for my belly, while something that fit the belly properly would fall off the waist. How to fix, how to fix? The answer was obviously darts. How big? How many? Where? I finally decided to just make a dart in the center of each woven panel. The calculations weren’t hard. Again I hand sewed, just in case. 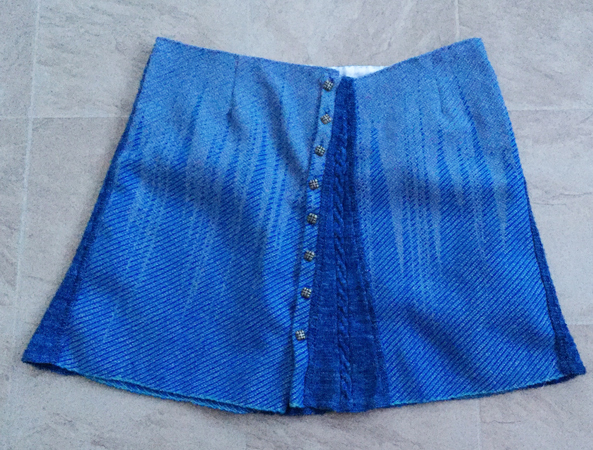 But now I had to finish the inside waist of this skirt. Wide twill tape was my answer. It’s not beautiful, but at least it’s functional. 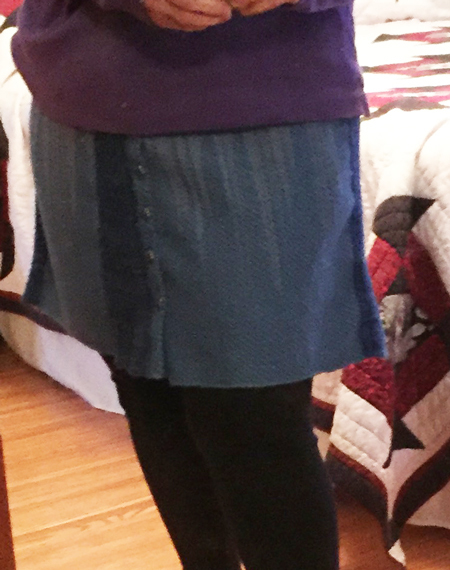 I finally finished the skirt last night – almost 3 months from when I began. So ignore the fact that the top edges, as shown in that first photo, aren’t perfectly aligned. At this point, it is what it is, and since I almost always wear a top on the outside, to help hide the big belly, no one will see it. I’m happy with the results, if not with my bulging belly. Will I do this again? Yes. I’ve learned a lot and won’t make the same mistakes the next time. And I just love the concept. Will I do it right away? No. I have to produce things to sell. I know how hard you worked on this skirt and it’s beautiful. Well done my friend! Yours up next. Learn from my mistakes. It turned out great. Sometimes many lessons are learned getting over the learning curve. Yep, Cindie, I learned a lot in this one, but it’s all worth it, at least to me. Oh, it’s lovely! Nicely done and looks great Peg! Thanks, Theresa. I’m happy with the way it looks, fits, and feels while wearing it. Now I wonder about making one in cotton for the summer…….But those knit panels, what would I knit them with? Cotton? Acrylic? Other? Hooray for you Peg… trying new things and pushing yourself… well done! Looks nice on you. Love your skirt. I am on the last knitted wedges for my skirt, problem solving to accommodate my own bumps and irregularities. Already planning a summer version. Had been thinking about darts, will follow your example!Thanks for the post. Oooooo…..would love to see your skirt, Linda. Will you post photos? Wowee – I really like your new skirt. How, though, do you sew knitted fabric to woven fabric without stretchng it all out of shape? This is amazing – I’m going to try to print this out to show our knitters!